The mountain pine beetle (Dendroctonus ponderosae) is a species of bark beetle native to the forests of western North America. It has a hard black exoskeleton and measures approximately five millimetres in length, about the size of a grain of rice. Figure 6.5 The Mountain Pine Beetle. The current outbreak of mountain pine beetle in British Columbia began in the early 1990s and is considered to be the largest ever recorded, affecting over 18.1 million hectares, or an area five times the size of Vancouver Island. 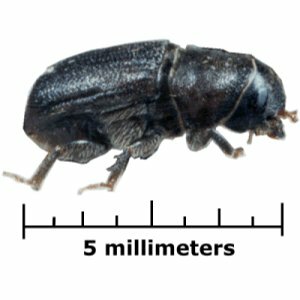 The mountain pine beetle infestation has had a devastating effect on the forest of British Columbia and has killed about 50% of the total volume of commercial lodge pole pine in the province. In British Columbia, the infestation peaked in 2005 and has been decreasing each year as the amount of available mature pines decreases. 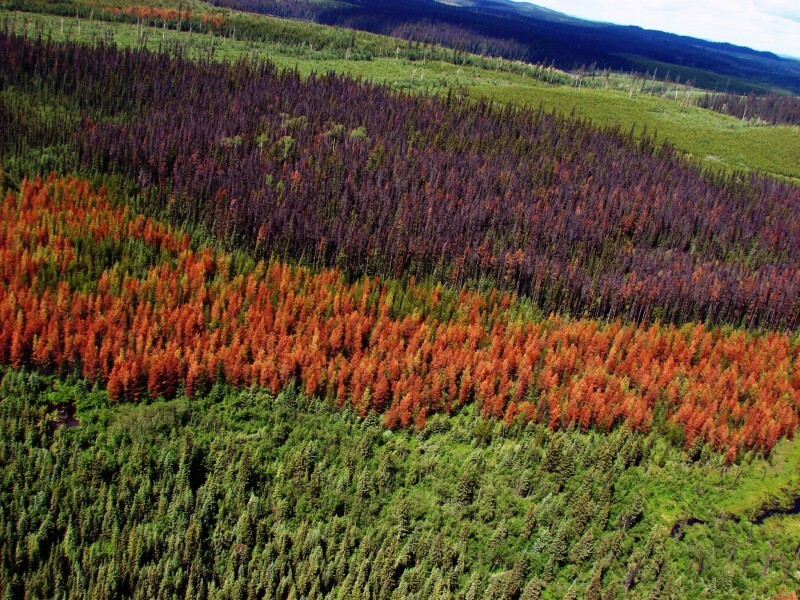 In 2012 about 3 million hectares of BC forest was designated as red-attack, which is where the needles of infected trees turn red as a result of the beetle killing the tree. This is down from 2011 when the amount of red-attack forest was 4.6 million hectares. Scientists believe that warmer summers and milder winters play an important contributing role to the beetle infestation. Cold Canadian winters with temperatures below -40°C normally kill the beetle as well as pine beetle eggs and larvae. But milder winters and warmer summers have meant more beetles survive the winter. 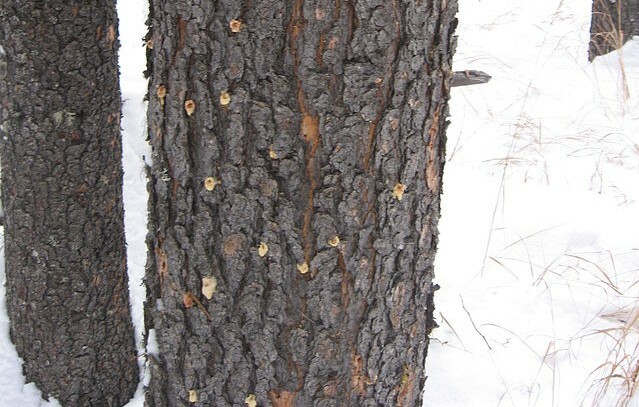 Until recently, it was believed that the mountain pine beetle could successfully attack only mature pine trees, but in recent years it has started to attack younger trees. Beetles develop through four stages: egg, larva, pupa and adult. Except for a few days during the summer when adults emerge from brood trees and fly to attack new host trees, all life stages are spent beneath the bark. It is the female beetle who initiates an attack. As they chew into the inner bark and phloem (the living tissue that carries organic nutrients), pheromones are released, attracting male and female beetles to the same tree. The attacking beetles produce more pheromones, resulting in a mass attack that overcomes the tree’s defences, resulting in attacks on adjacent trees. Natural predators of the mountain pine beetle include certain birds, particularly woodpeckers, and various insects. Digital or film aerial photography is a popular method for monitoring and precisely mapping vast areas. Recently the digital era reached aerial photography and since 2010 almost all images acquired worldwide are done by direct digital cameras. Satellite imagery is another method of acquiring images from space. Both methods have advantages and disadvantages that relate to the nature of the acquisition and image quality. Remote sensing and aerial photography are used extensively to monitor diverse forest environments, map cities or countries and identify geological structures. Precise mapping is an example of a remote sensing process that has reached technical maturity and is used in practical applications worldwide. Image classification is generally accomplished by several procedures that involve human vision and/or computer algorithms. Visual image segmentation is conducted by interpretation of targets from within an image on a computer monitor, while aerial photographic segmentation is performed a large-format photograph hardcopy prints (23-cm²) and can be assisted with an overlapping image acquired at a different angle that enables three-dimensional vision. Statistical computerized image analysis is undertaken with algorithms that segment the image into several predetermined classes within a digital image. Forest areas are frequently surveyed by various remote sensing devices for both practical and experimental purposes. The application of classification methods for forest mapping and classification reaches relatively acceptable levels of classification accuracy (65% to 90%), depending on data quality and implemented procedures. Mountain pine beetle infestation can be detected and monitored by remote sensing methods. This can be done visually on computer monitor or directly by flying above an infested area. The main characteristic of infested trees is the reddish colour on the tree crowns. Figure 6.7 Cumulative percentage of pine killed and projected to die 2020 from A History of the Battle Against the Mountain Pine Beetle 2000-2012 B.C. Ministry of Forestry (http://www.for.gov.bc.ca/hfp/mountain_pine_beetle/maps.htm). Figure 6.8. Pine tree infested by mountain pine beetle; the pitch tube that the tree is creating to force the beetle out are clearly visible. Infested Tree (http://en.wikipedia.org/wiki/Mountain_pine_beetle#mediaviewer/File:Infested_tree.jpg) by Padraic (http://commons.wikimedia.org/wiki/User:Padraic) under CC BY SA 2.5 (http://creativecommons.org/licenses/by-sa/2.5/ca/deed.en). Figure 6.9. 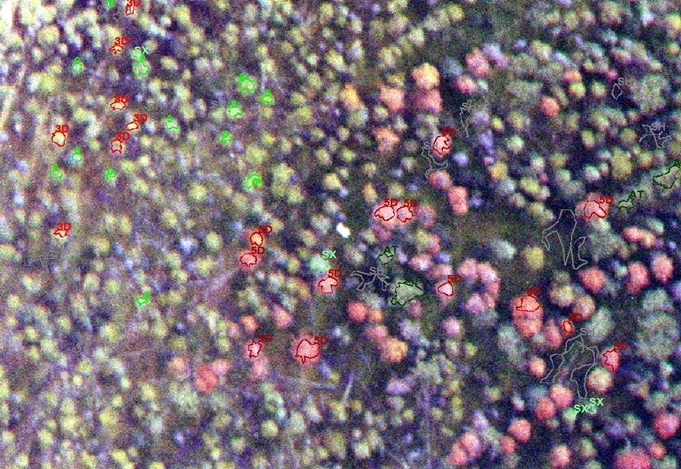 Healthy pine trees (green) and trees infested by mountain pine beetle (red); the delineating polygons used for computerized classification procedures. Image from Ettya A. 2009. Integrated Multitemporal and Multiangular High Spatial Resolution Image Classification. Burnaby. SFU. PHD Dissertation. Case Study 1: Mountain Pine Beetle by Geography Open Textbook Collective is licensed under a Creative Commons Attribution 4.0 International License, except where otherwise noted.